Designed to be a right-sized, tough, every day carrying and work knife, The extra-wide, drop-point blade offers excellent slicing and will handle just about any other kind of cutting task as well. 8Cr13MoV stainless steel makes the blade sturdy and offers good edge-holding capabilities. Unusual jimping on the blade back adds style without being so aggressive that your thumb complains. A stonewashed finish hides scratches. For a good grip, the Swerve has a contoured handle that "swerves" slightly to fit comfortably in the hand. 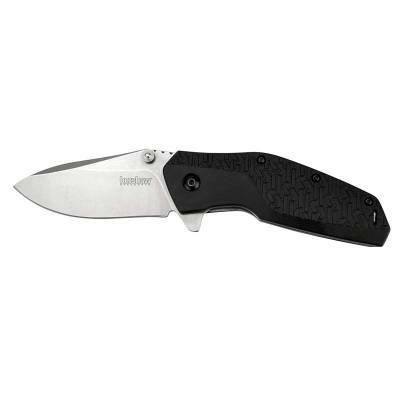 Kershaw’s exclusive K-Texture™ on the handle enhances grip. The Swerve opens one-handed with SpeedSafe with either flipper or thumbstud. For convenient carrying, it also has a reversible, deep-carry clip.